Mike Ballard: The Four and a Half Month Update. 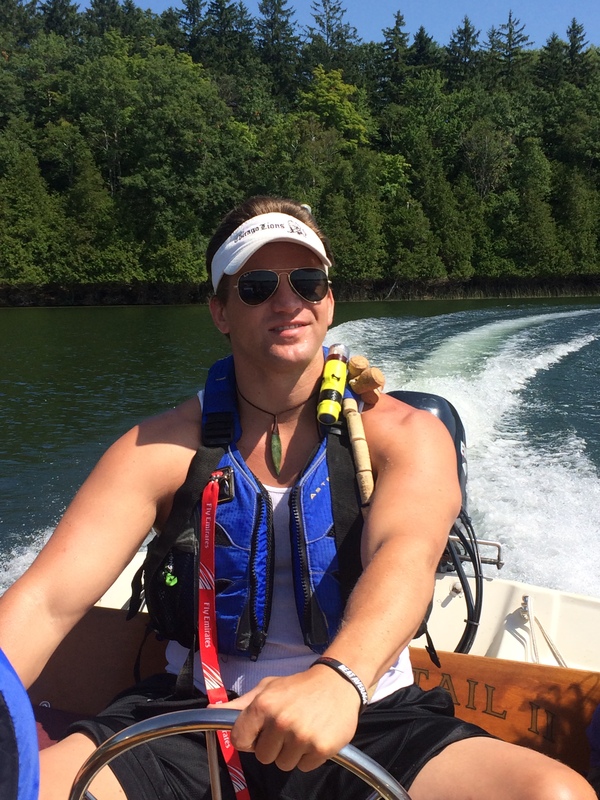 Mike Ballard boating on Lake Ann. “It’s been an incredible ride [imagine a strong American accent]. From when the injury happened; to Mafraq Hospital; to the support I received there from my Mum and the rugby boys and girls – Phil Abraham, Andrew Hall and Eileen Siegel didn’t sleep – they were there looking after me every minute of the day; to getting medevaced to Mary Free Bed Rehabilitation Centre in Grand Rapids in Michigan, my home state; to seeing my family; to having an awesome team of doctors and nurses (Dr. Ho was running the show, Katie Larsen was my physical therapist, Diana was my occupational therapist and Andrea Zajac was my social worker … a.k.a. the paperwork goddess); to smashing all the records there and becoming independent which was my goal in going there. When I’m talking about records, I’m talking about jumping curbs on the first go, balance in general, and having the highest vitamin D levels the Doc had ever seen [Living in Abu Dhabi is good for that]. I was an inpatient for about 5 weeks, even though I had a week in the hospital for two bonus surgeries [The classic understatement]. 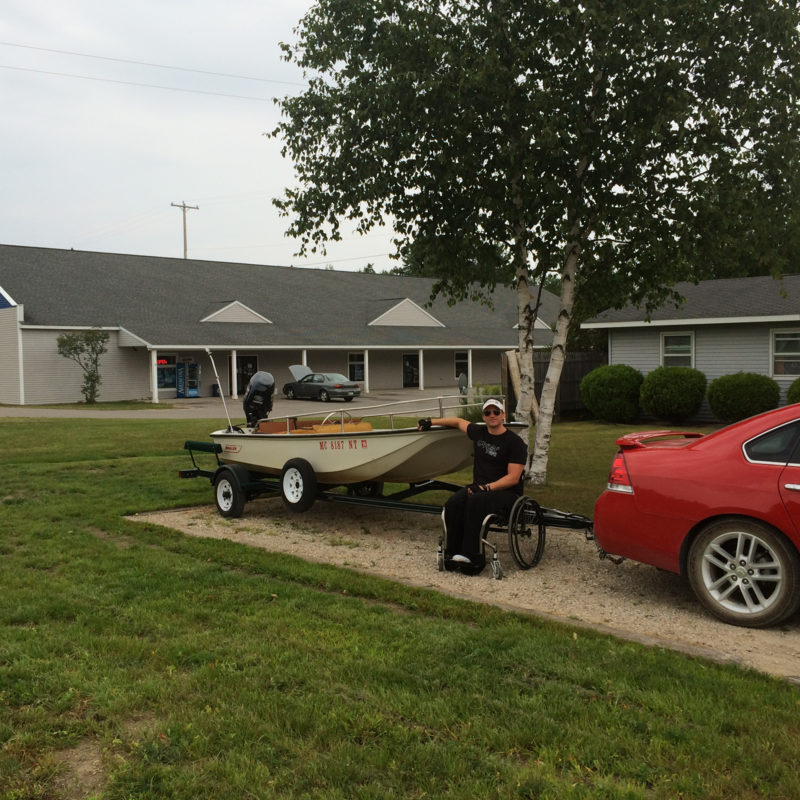 Mike Ballard and his new wheels. “Other things were awesome like receiving messages of support from rugby and league legends like John Smit, the Springbok captain; Steve Borthwick and Chris Robshaw, England captains; the Vunipola brothers; Kelly Brown, the old Scotland captain; Kevin Sinfield, the England Rugby League skipper; Chris Ashton, the England wing, the swan-diver; the Glasgow Warriors –all you boys taking the time to get in touch was a huge lift so thank you to you all [awesome blokes – good on ya]; moving home here to Mum and Dad’s at Lake Ann was a relief; to doing hill sprints up the driveway too many times that I developed carpal tunnel syndrome – I had to pull back on the rehab a bit – I realised that rest is sometime good too [wry chuckle]; to becoming an outpatient – I have four hours gym a week with the occupational therapists and then the rest is up to me; I’ve been working hard – real hard [see Mike’s rehab progress below]; and then there was June and July when I was visited by so many good friends from Abu Dhabi – I got pretty good at BBQing. “I am way ahead of where I should be in every demographic – I am even making the therapists uncomfortable with my progress – they want me to slow down a bit, so I’m on the right track; I would prefer to max out my balance and risk falling down, but a patient falling down is bad news for the Personal Trainer who is working with them … So they have to reign me in a bit when it comes to the exercises. I have also been hitting the pool and the gym. The pool is great – I basically swim with my upper body and work on muscles so that my legs stay straight behind me; I move my hips so basically I’m doing the flutter kick. It’s a zero gravity environment so I can work on firing muscles and re-training my legs so my head, muscles and nerves are all on the same page. In the gym there is this thing called the tilt table and it basically tilts you so you can stand up – you are meant to have three straps and I am down to one around my knees. Taking away two of the three straps was something I really had to work on the therapists to do … They weren’t too comfortable with it initially. I weigh 200 pounds and I’m counting on a middle aged 120 pound lady to catch me. I basically stand there and play catch with two medicine balls while I am standing up; a point of pride for me is that the therapists come out of sessions more bet-up than me. They’re not used to that. They haven’t asked me to do anything I haven’t been able to do so I’m making progress. “I’m making progress when given the time and space to run my routine. I tell you what – it’s an ab work-out. When I lose some weight I am going to have a six pack. Imagine a nasty 15 minute crunch or 15 minute bridge workout. The way I see it, if your bladder is full, and you fill your lungs with air, and you flex your abs enough, your bladder doesn’t have an option … it’s going to empty. It’s hard but I’m getting there, man. It also saves me $2US for each catheter so, anytime I’m independent it’s a victory [Jees, I admire you mate]. Mike Ballard. Doing more than well. Doing exceptionally well. You continue to blow us all away, mate. Proud, Mike. So incredibly proud of how you are doing. 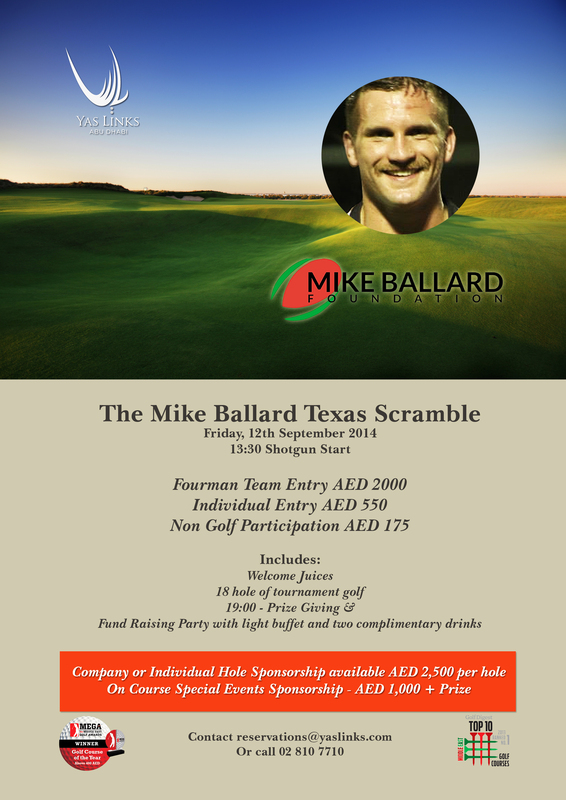 FYI – the next event in Abu Dhabi’s programme of fundraising events will be the Mike Ballard Texas Scramble Golf day, held at Yas Links golf course, Yas Island, Abu Dhabi on the 12th Sept 2014. Flyer below. Get involved!